Many investors look for specific catalysts when it comes to the stocks they buy, and that’s a practice I encourage – especially when there’s a regime change at the very top. Because a change of leadership can be extraordinarily profitable. Let’s start with David Solomon. He’s the firm’s new CEO, and he takes “the chair” from current CEO Lloyd Blankfein on Sept. 30, only nine days from now. A political science major out of Hamilton College, Solomon’s taken a circuitous route to the top that’s included stints at Drexel Burnham Lambert, where he sold junk bonds and commercial paper, and time at Bear Stearns, where he rose to prominence running the investment banking division. Solomon jumped to Goldman in 1999 where, again, he rose through the ranks and made hay in the investment banking unit. According to CNN, the investment banking unit’s sales jumped 70% during his tenure. Goldman promoted Solomon to president last year in a move that put him side-by-side with Harvey Schwartz, who subsequently resigned last March. And, in doing so, he all but made Solomon the heir-apparent. Solomon is as unconventional as he is bold, and I think that’s a real advantage at a time when the firm needs dramatic change. Not many people know this, but Solomon moonlights as “D-Sol” on the electronic dance scene, and claims more than 425,000 monthly listeners on Spotify. His single, “Don’t Stop,” was released this past June, and it’s a very catchy remake of the 1977 Fleetwood Mac original, if I do say so myself. Anyway, back to the trade setup. I think Solomon will quickly remake Goldman Sachs in his own image. He’s certainly not letting the moss grow, naming Stephen Scherr as CFO – which returns current CFO Martin Chavez to Goldman’s trading division – John Waldron as president, and Tim O’Neill as its vice chairman. Start the Countdown: In just FIVE days, you could have a fat check for $23,441 in your mailbox. And the best part is, it’s just one short phone call away. Over 80% of eligible seniors may be entitled to this cash. Are you one of them? All four men have deep roots and experience in investment banking, so this is a marked departure from the trading-centric cabal that’s run the firm for decades. It’s also a change in direction because investment banking is a relationship-driven business, characterized by personal knowledge and experience as opposed simply to revenue, which is typically the case for firms driven by trading. I think this will result in entirely new levels of profitability that blow by the $5 billion revenue growth plan implemented in 2017. And not a moment too soon. 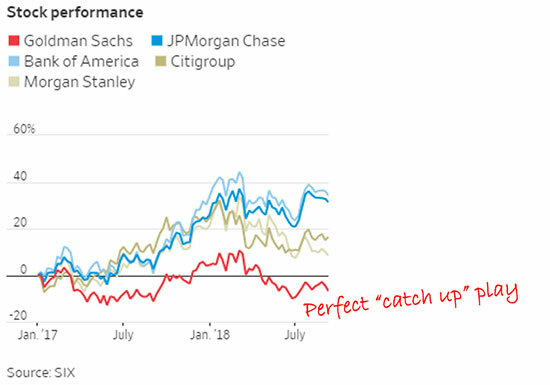 Goldman has lagged behind peers like JPMorgan Chase & Co. (NYSE: JPM), Bank of America Corp. (NYSE: BAC), and Morgan Stanley (NYSE: MS) in recent trading. Which means this is a classic turnaround play that’s almost completely unrecognized by the Street, as I type. Now for the fun part: profits. The easiest and most straightforward way to play along is to buy Goldman Sachs stock. Right now, it’s trading at $228 and change, as I type. I think it’ll take out the 52-week high of $275.31 and keep going, possibly all the way to $300 a share by 2019. That’s good for a relatively quick and very respectable 31.58%. But I want great, and I have no doubt you do, too. That is, after all, why we’re here! My favorite play in a situation like this one is to buy a vertical call spread, using the GS Nov. 16, 2018 $230 Call (GS181116C00230000) and GS Nov. 16, 2018 $235 Call (GS181116C00235000) options. As an aside, you could also vary this by using 10- or even 15-point spreads between strikes, if that matches your personal return objectives and risk tolerance. The numbers are roughly similar, and you’ll still be shooting for a double. Vertical call spreads are a terrific way to play stocks poised for a quick move. They’re also a great way to balance risk and reward with a realistic forecast. Vertical call spreads, in case you’re not familiar with ’em, always involve two call options with the same expiration date but different strikes. You pay for the options together, so your risk is limited to your initial purchase price – a “debit” in accounting speak. In a nutshell, you’ll be simultaneously buying one call option and selling another one with a higher strike. The reason you do that is you’ll typically get more “juice” on your trade because the short option with the higher strike (that you’ve sold) helps pay for the long option with the lower strike (that you’ve bought). The trade-off – at least according to some folks – is that your upside profit potential is “limited” to the difference in premiums between the two options. I don’t think that’s a big deal when you’re shooting for an appealing 100%, though. Right now, the spread is trading at $2.21. That means your order will be: Buy-to-open the GS Nov. 16, 2018 $230/$235 Call spread, limit $2.50 GTC. “Buy-to-open” means you’re establishing the trade. The “GS Nov. 16, 2018 $230/$235 Call spread” refers to the two strikes and the month the options will expire. The “limit” means you don’t want to pay a penny more than $2.50 for the trade. “GTC” means that you’re entering the order “good till canceled.” That’ll buy you some time for market conditions to come to you if needed, while also freeing you up from the need to sit by your trading screens all day. Just don’t forget to check back in a day or two and “kill” the order if it doesn’t fill for any reason; the last thing you want is a trade to trigger that you’ve forgotten about! My profit target on this trade is $5, excluding fees and commissions, which vary from broker to broker. At that point, you will have made 100% on your money if the trade goes as planned, based on the numbers I see as I write. Obviously, a reversal in overall market tenor would change things, but that’s a function of risk management, not pre-trade planning. Risk management is pretty simple when it comes to a trade like this one. I suggest using a 50% “give back” in the event things don’t go as expected – meaning if you buy the spread at $2.50, then you’d exit the trade and consider it busted at or below $1.25 for a loss of 50%. As always, this is a speculative trade, so do NOT invest money you can’t afford to lose. Better yet, control risk before you enter the trade using position sizing – something we’ve discussed before as a means of maximizing profits. I will be with you every step of the way, as always. Canada is days away from implementing its historic new marijuana legislation. Don’t miss your shot to get in on the ground floor of what could be the biggest market shift in our lifetimes. In this urgent briefing, you’ll discover exactly how to position yourself to cash in… including the top three stocks to buy right away.